Dubai, UAE, 15 March, 2018: One of the longest running partnerships in Middle East motor sport has entered its 15th year with the approach of the Abu Dhabi Desert Challenge Powered by Nissan, which turns the focus of the cross country rallying world on the UAE capital again later this month. Title sponsors Nissan Middle East have joined forces again with the Automobile and Touring Club of the UAE (ATCUAE), the rally organisers, to present one of the most spectacular events on the World Cup stage. Kalyana Sivagnanam, President Nissan Middle East and Regional Vice-President Africa, Middle East & India Region, today signed the new sponsorship agreement with Mohammed Ben Sulayem, President of the ATCUAE and Emirates Motor Sport Federation, and FIA Vice President for sport. 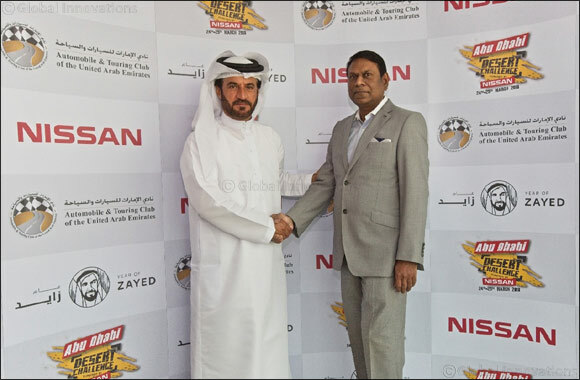 'Nissan, and the Nissan Patrol as the official car for the event, have become synonymous with the Desert Challenge over the years, and we are very happy to extend the very close working partnership we enjoy with the ATCUAE,” said Sivagnanam. Nissan's sponsorship of the Desert Challenge guarantees wide-ranging support for the event, including the supply of a fleet of Nissan Patrols used by the ATCUAE’s route planning team to map out the competitive special stages that cut through the giant dunes of the Al Dafrah Region. The fleet will also be used throughout the event to transport rally officials, marshals, dignitaries and media representatives through the demanding desert terrain. Continued backing of the Desert Challenge underlines the powerful support provided by Nissan Middle East to regional motor sport, and to the ATCUAE in particular. The rally, which is also part of the FIM Cross Country Rallies World Championship for bikes and quads, brings top-class desert action quickly back to the UAE following last weekend’s Dubai International Baja powered by Nissan and AW Rostamani.